We went to Bristol this weekend, and managed a quick visit to Get Knitted whilst we were there. I have been a very satisfied on-line customer for some time (great service) but the shop is amazing. It’s really well thought out. There’s a children’s corner with books and toys, comfortable sofas with magazines, snacks and drinks, as well as toilet facilities and free parking nearby. It’s an aladdin’s cave of yarn – almost too much to choose from, but this really stood out. It’s Manos Silk Blend. It’s beautifully soft and comes in really lovely colourways. 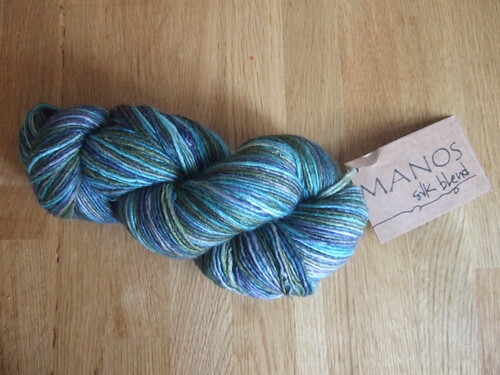 Unfortunately they only had one 100g skein of my favourite colour, but I bought it anyway. I plan to make (yet another) crochet shawl with this – I’ve already started swatching.